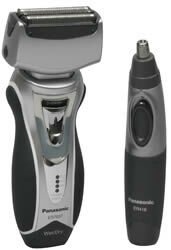 Our Deluxe Gift Set also comes with an ergonomic wet/dry ear and nose hair trimmer. The perfect compliment to the triple blade Men's Shaver. Both items are great for taking care of a man's daily grooming needs. Our washable shavers can be rinsed clean under running water. Just following the easy cleaning steps to keep your shaver fresh and clean. Independent floating triple heads follow facial contours to provide a clean, close shave. The Center Slit blade cuts long/stray hairs and the foils on each side cut even closer. Our 3-Stage Battery Monitor indicates the battery charge level and lets you know exactly how much power remains. The light shines green (for fully charged to mid-level), then orange (from mid- to low-level) and then flashes red when the shaver needs to be recharged. This page is part of GeneralManual.Com Network Panasonic ES7037CMB Men's Shaver/Trimmer User Manual.